For many Candy Addicts, the most wonderful time of the year isnâ€™t Christmas â€“ itâ€™s the post-Christmas sale season (what businesses here in Canada refer to as â€œBoxing Week,â€ the natural extension of the traditional Boxing Day sale). Boxing Week is an excellent opportunity to compensate for a disappointing Christmas by buying what you really wanted at crazy-low sale prices â€“ and that goes for candy as well. Stale candy canes? Mockolate Santa that might just be left over from last Christmas? Make up for it by buying yourself a nice box of Ferrero Rochers or Lindors at 50% off. I actually had a very good candy Christmas (which you will see the evidence of in future reviews), but like many people, I canâ€™t resist a bargain, even when Iâ€™ve already got a heap of Christmas chocolates at home. 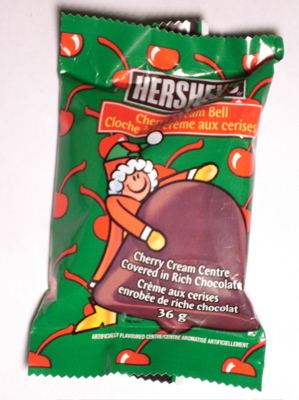 And so, I couldnâ€™t resist grabbing a couple of these Hershey’s Cherry Cream Bells â€“ 31 cents each at my local Wal-Mart (yeah, yeah, I know). Usually chocolate items like this are filled with marshmallow, but in the case of the similar Whipped Creme Santa I just reviewed, â€œcremeâ€ meant a smooth, sticky marshmallow creme. (Hershey’s managed to get away with the proper spelling of â€œcreamâ€ for this item, perhaps due to the presence of actual milk ingredients.) I was expecting something similar from this item â€“ with, of course, cherry flavor, but wasnâ€™t overlooking the possibility that it was one big chocolate-covered fondant cherry cluster either. I like chocolate-covered cherries â€“ but not necessarily ones as big as my palm. My family raised me on dark chocolate. Everything good had to be dark chocolate – bars, covered raisins, even cookies. 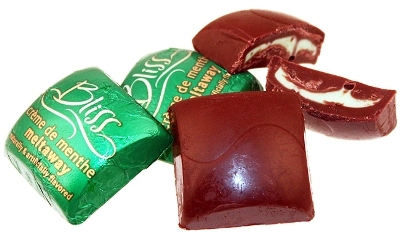 Milk chocolate was tolerated in my family, but was often considered only a viable alternative when dark chocolate could not be found. However, white chocolate was banned. I am not sure what my parents had against this confection, but whatever their reasons were, I too decided I hated white chocolate. I never bought or consumed the stuff for years. It wasn’t until I started dating someone who hated all forms of real chocolate, and thus loved white chocolate, that I even gave it a second glance. 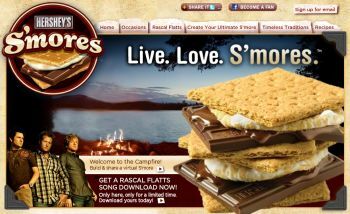 I pretended that I too adored white chocolate, for the sake of appearing to be on the same page. To my surprise, whenever we shared a Zero or white chocolate Toblerone, I found myself enjoying it. Since then, I have been consuming more and more white chocolate. There arenâ€™t many popular brands readily available for purchase, but there are a few. 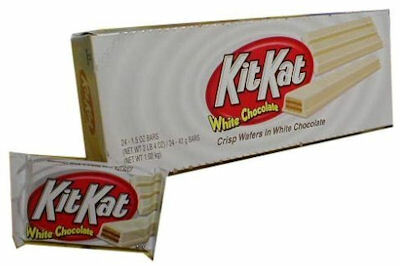 KitKat White just happens to be the one that recently caught my eye at my local H.E.B. Welcome to Part Two of my mission to discover if candy and dieting can live together harmoniously. Last time, I wrote about the pros and cons of the Reese’s 100 Calorie Peanut Butter Wafer Bar. Today, I have the pleasure of sharing with you the delectable taste of Hershey’s 100 Calorie Crisp Wafer Bar. If you have been avoiding a diet because you couldn’t stand the thought of giving up candy bars, fear no more! I have discovered the absolute epitome of low calorie, diet-friendly chocolate bars. Are you ready? Lend me your ears, Candy Addict.